That's such a chic and classic trench coat dear. I love it, super versatile! Thanks Jess! I think trench coats are such a classic! Great outfit ideas, I really like the trench coat in the first pictures - such a classic piece! I adore both of these looks! That tan coat is so chic. A striped shirt is such a wardrobe staple! I do love that fab print too. You've created very beautiful looks. I love the unexpected pop from the scarf! It really makes for such a cool contrast. i hope you're feeling better! It's taken me forever to recover from this bug! Thanks! It's so hard in winter, so many bugs around to recover from! I hope you're feeling better Mica. It's no fun when you're sick. But stripes are definitely a great print---funny because our t-shirt dresses on the blog today, are stripes too!! Cute outfits! Loving the stripes! I'm with you on stripes being the best print! 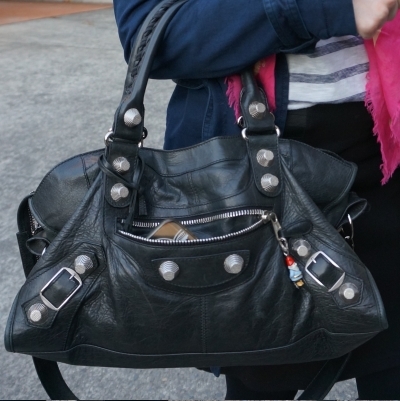 It's fun to see how you pair yours with different pieces in your wardrobe. I especially love the second outfit with the pink and blue shades! Love that burgundy stripe. Glad you got it our and wore it. I love both striped looks. I always gravitate toward stripes! Thanks Amy! It was definitely overdue a wear! Ugh, those winter bugs are the worst - I hope you feel better soon, Mica! Great outfits - I'm a fan of stripes, and I like how they combine with the McQueen skull scarves (which are fabulous). I hope you have a good week! Thank you Sheila! It has been a tough winter! I need more stripes in my life. Both of these looks are great! And once it's warmer out you can just take off all the extra layers and wear sandals! Definitely! A classic for any season! I'm really loving both outfits, especially that first one! I love red striped tees paired with either olive green or camel, so chic! Thanks for sharing and Happy Monday! I love that you chose to pair these outfits with stripy tees. I'm gravitating towards the first outfit because of the red and white stripes. Brings out a pop. Beautiful! I like the pink scarf in the second picture and you styled and put it together so well. Lovely pictures. Stripes and sculls are so fun. Edgy but so mainstream too. Stripes are one of my go to prints as well. I hope you feel better soon. Thank you Amy :) I'm feeling better. You look really beautiful..love your style. Blue looks so very good on you! I hope the bug is gone in your family! Thank you Nancy! It's been a tough winter! Stripes are very trend this summer....I love them because they are timeless. I'm not sure are they fav print but they are definitely one of my favs. 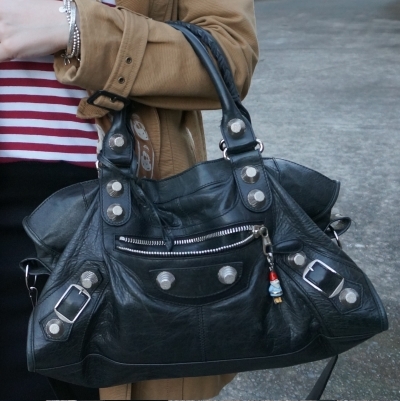 Love your striped top...This black bag is so cute. Nice scarves as well. Great outfits. Have a great start of week! 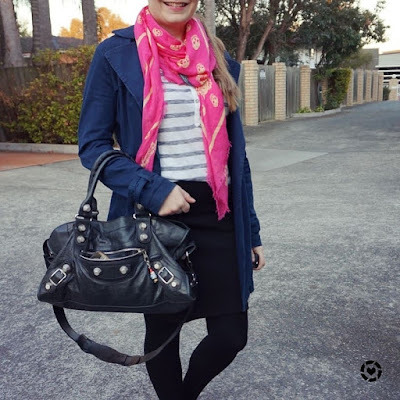 I love the bright pink skull scarf! A shirt I wear frequently has a glitter skull at the front and people comment on it so often, telling me I shouldn’t wear pieces like that. Has that ever happened to you? It is really annoying. Stripes are the best and you can't go wrong with it. 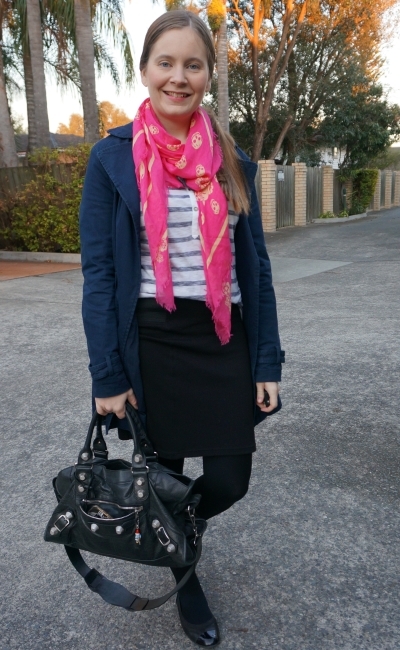 Love the pink scarf on the second outfit but really both looks work for me! Both looks are perfect for the cooler summer days. 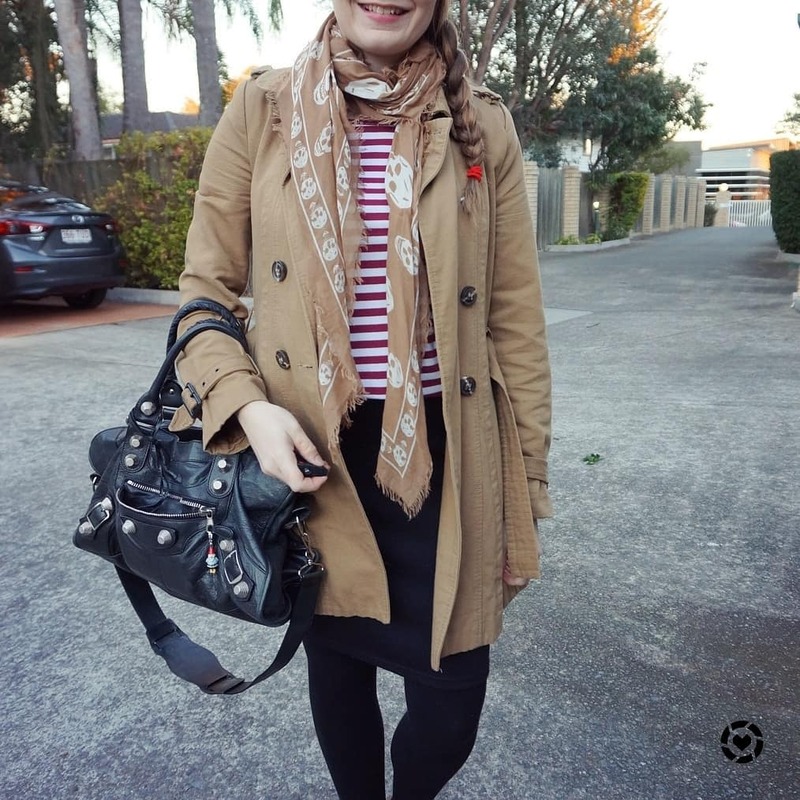 Scarves are an absolute must during the colder months and so finding stylish options is a great idea, when they have to be a part of our outfits whether we like it or not, haha! :) Hope you're having a great week so far babe! You look so chic, lady- love that McQueen scarf! Hope you're feeling better, Mica:( On a good note, you look great in both outfits:) I love stripes. My husband always jokes that everytime we go to stores, striped shirts always seem to call my name. And I do love that trench coat. You look so Parisian in that first outfit. haha yes I'm the same with stripes! Thank you, I'm feeling much better! Thank you :) Yes, this time of year is so tough here! I wish you quick recovery. i love this ensemble. Am obsessed with scarfs and I think this is a really beautiful one. I enjoyed the video too. Kisses! I agree that stripes are a great go-to print because they go with everything. I love both looks, but the first one if my favorite. 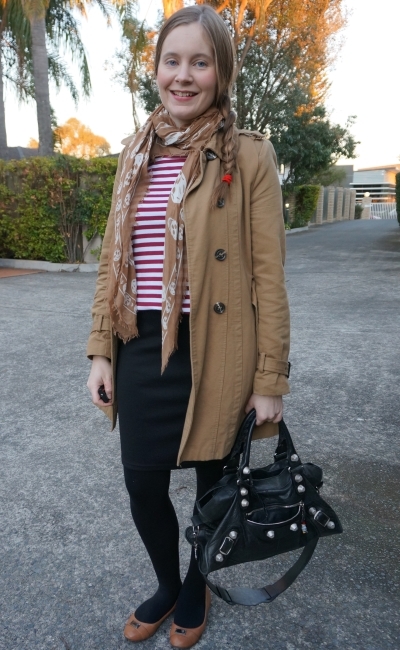 I love the combination of red stripes and camel. I really love your scarf collection. Whenever I see you wear them I think I say it. The Alexandar McQueen collection is my favorite. They are such a fun scarf, I can never resist when I see one on sale, haha! I have two of these scarves, one black and one white and I remember wearing them all the time when I bought them. Need to dig and find them to wear in fall! Loving the skull scarves, Mica! The brown one is gorgeous, you styled it well!